A dental implant is an option for replacing a missing tooth. An artificial root, made of titanium metal, is inserted into the jawbone to replace the natural root. An artificial tooth called a crown is attached to the implant to fill the space of the missing tooth. Dental implant surgery requires that you are in good general health and that you have enough jaw bone to support the implant. If you do not have adequate bone support, a bone grafting procedure may be required prior to implant placement. At the Fort Frances Dental Centre, we have the technology to take a 3D scan of your jaw. This 3D scan allows us to assess your level of bone support and helps us determine if you are a candidate for implant surgery. 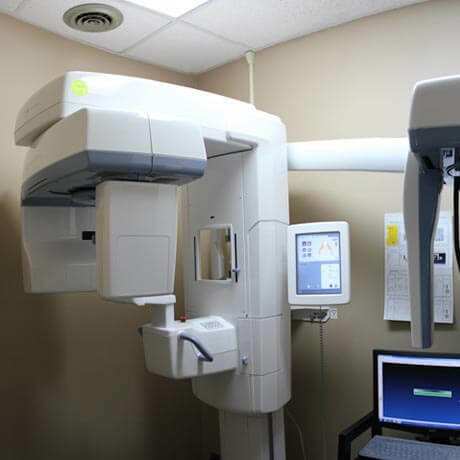 We use the 3D scan to map out the placement of the implant for best results and successful treatment. Implants involve several stages of treatment. Once the implant has been placed into the jaw bone, your dentist will stitch the gum tissue and allow time for healing. Over a few months, the titanium implant will fuse to the surrounding jaw bone. Once the tissue has healed, your dentist will attach an abutment to the implant. This abutment connects the crown to the implant. In some cases, this may be done at the first appointment, right after the implant has been placed. In the final stage, your custom created crown is cemented to the abutment on the implant. Mini implants are small diameter implants that are often used to stabilize dentures. Like traditional implants, a mini implant involves placement of a titanium alloy post into the jaw bone. The head of the mini implant is shaped like a ball. 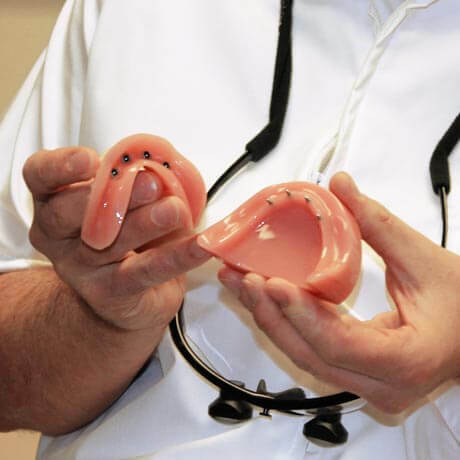 A retaining fixture on the denture acts like a socket with a rubber O-ring. The O-ring snaps over the head of the mini implant and holds the denture securely in place. Because the mini implant procedure is less invasive than traditional implant placement, the healing time is typically shorter. 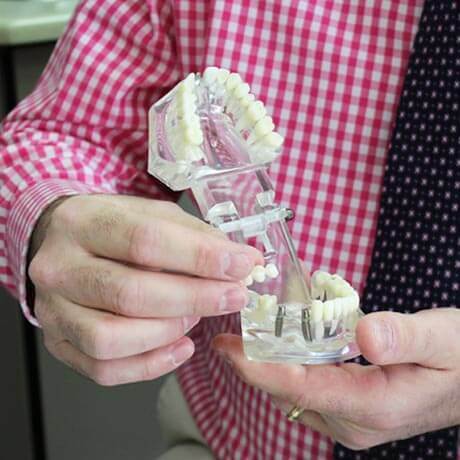 This allows us to stabilize the denture the same day that the mini implants are placed. In some cases, mini implants can be used to replace a missing tooth the same way as traditional implants. Speak with your dentist about your treatment options. Mini implants are available at our Emo location, but require one visit to the Fort Frances Dental Centre for the initial 3D scan.